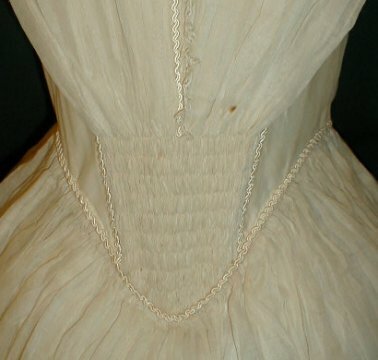 I did find a few more examples of a the tablier style covered in beads. But I need to explain what a tablier is. It means apron. 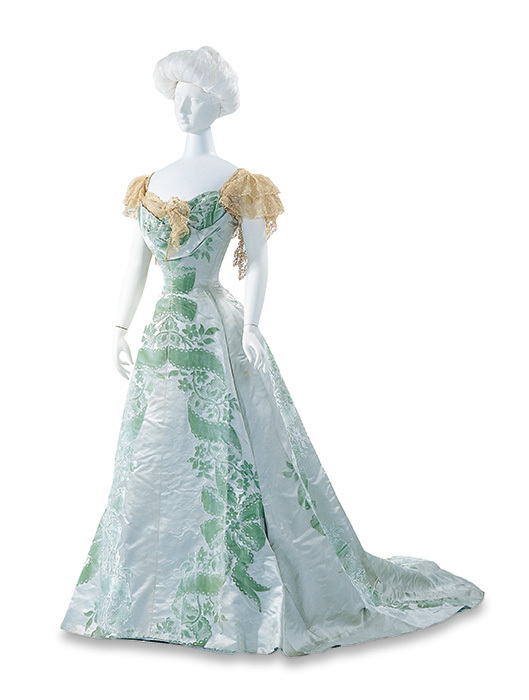 But it is important to understand what an apron in fashion in the natural form and sencond bustle era looked like. It was plain and pulled back. 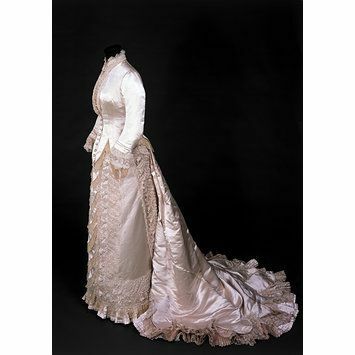 So it’s basically a plain skirt front as opposed to one covered in drapery or rushing etc. 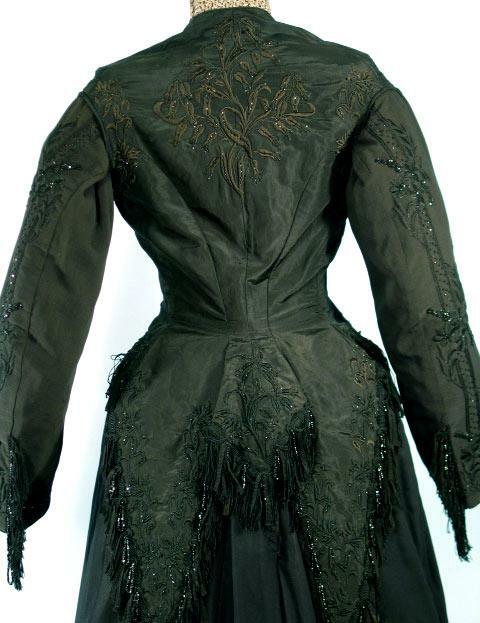 A garment found several years ago on ebay. 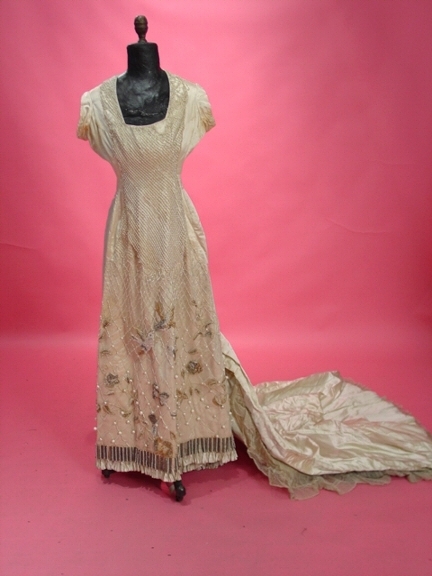 There was some exploration of asymmetry of these overlayers of beaded silk especially when on a delicate fabric. I adore these oversized pearls on thin silver beaded loops. 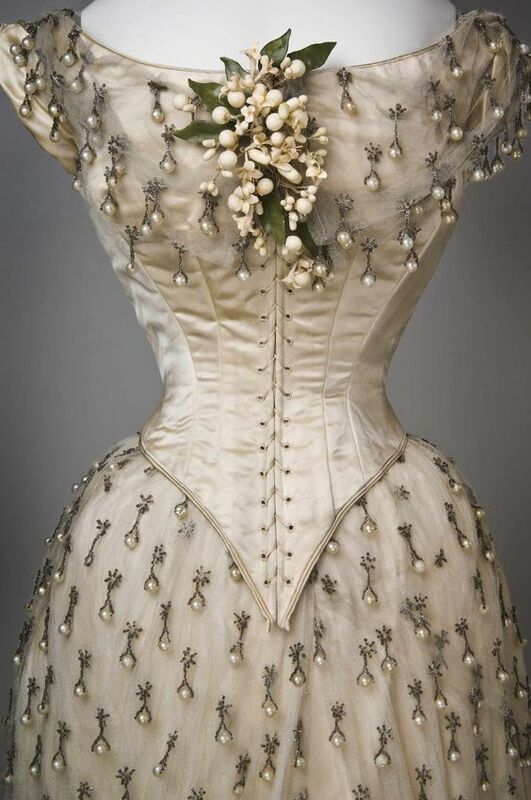 Some of the other gowns how tassels and loops made from matching pearl beads (see garment immediately to right), but this is quite a statement. And then we come to the two Sunburst gowns. Worth regularly repeated his designs, with some adjustments based on the new client. 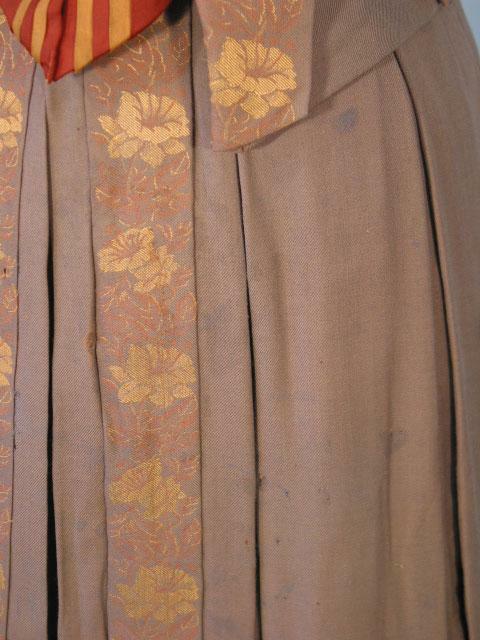 This just happens to be a very obvious copy due to the single large stylised motif across the entire skirt. These just stand out a mile away! 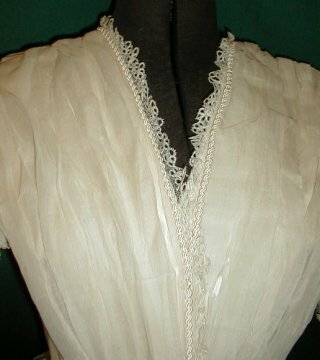 These do also make use of cut work and so perhaps represent an early start to the later gown with heavy use of cutwork. 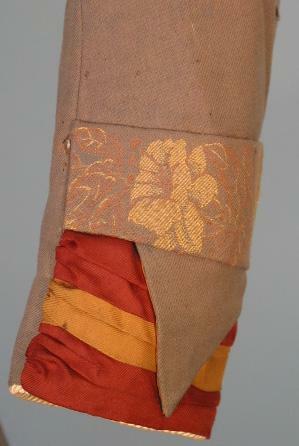 They certainly show more in character and line to the vertical plant motifs than the layers of net and beads. 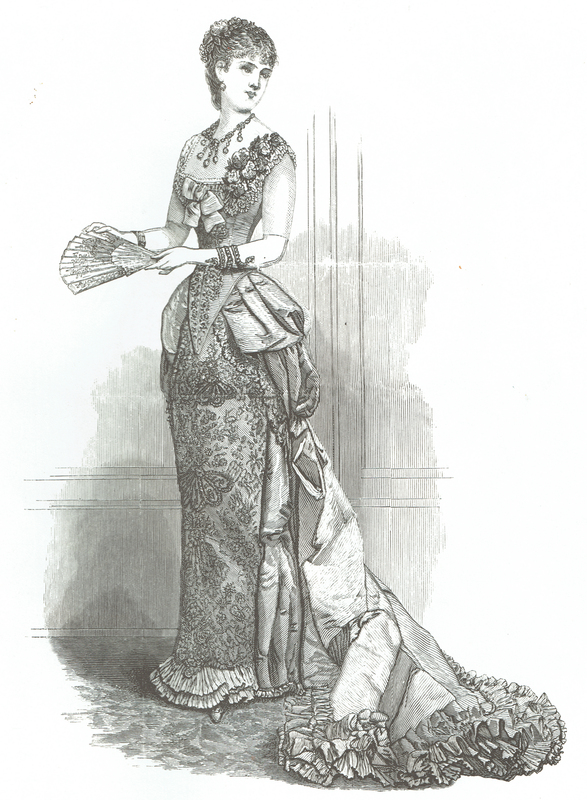 And that seems to have lead to experimentation with full skirt length motifs. 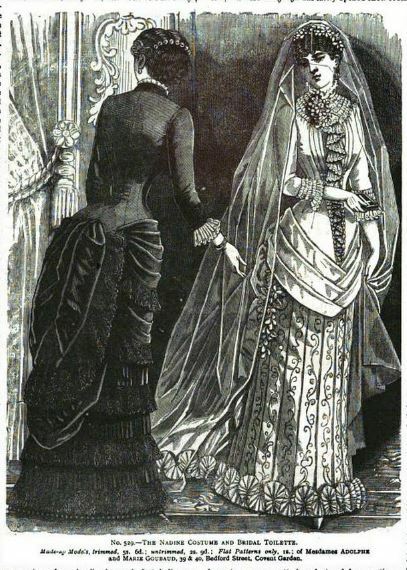 Harper;s Bazar, 1894. (3.17.94, cover) Coiffure from Lentheric of Paris. 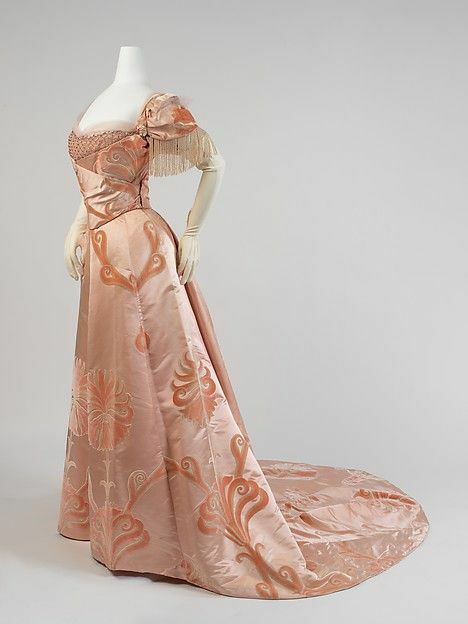 Pale sky blue satin bordered in black fur. 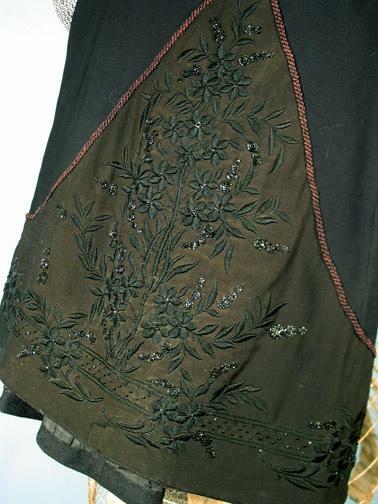 Beaded irises cover the side front seams. 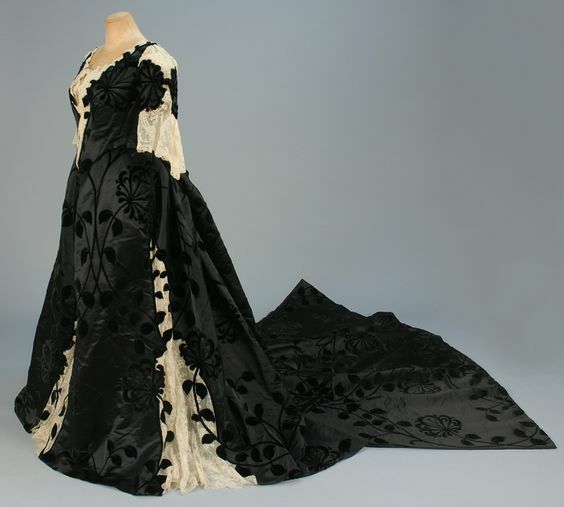 Author: Madeleine Ginsburg; Victoria and Albert Museum. Publisher: London : H.M.S.O., 1981. 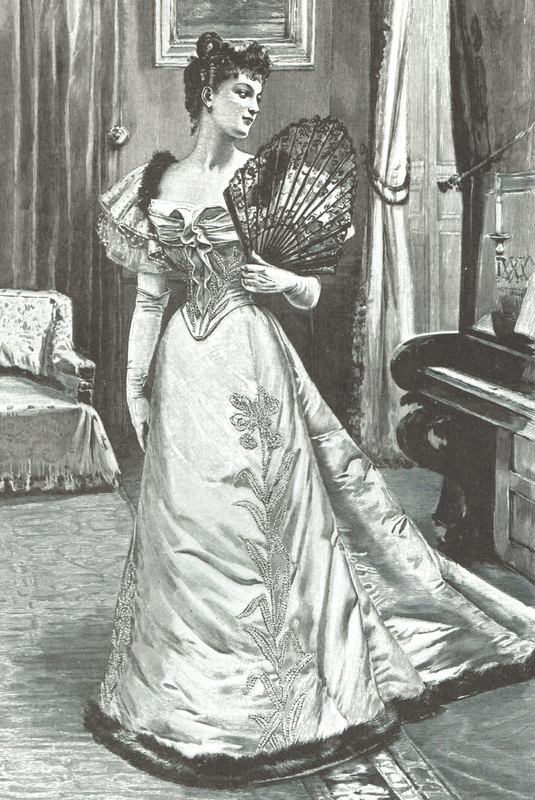 How to dress well on a shilling a day: a ladies’guide to home dressmaking and millinery. 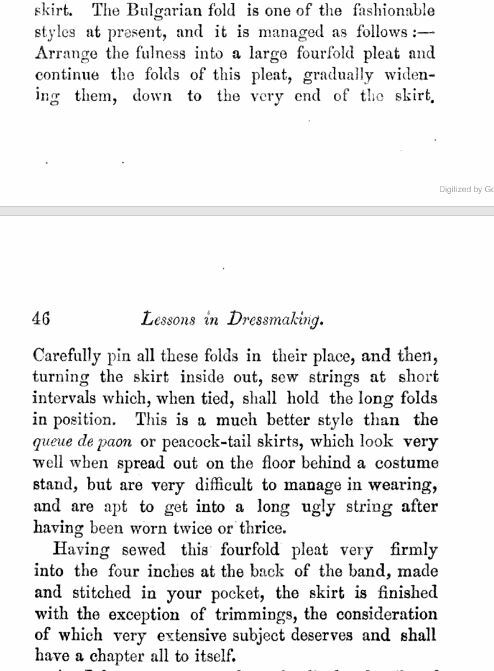 Highly recommended for the text as it describes the order of sewing and how to. 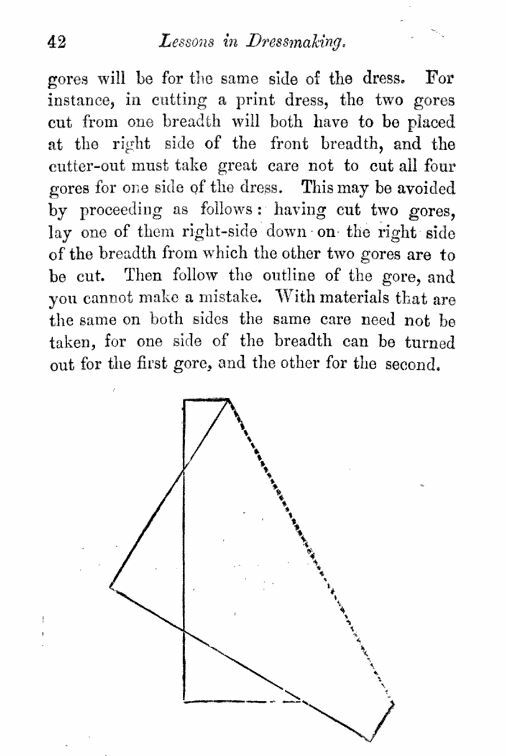 That paragraph on the “bulgarian fold” is really amazing! At least for coming out and stating that the “peacock” style train is impossible to self arrange! Which is something I have trying to get across when getting photos of my gowns with trains- they need a wrangler to look good! 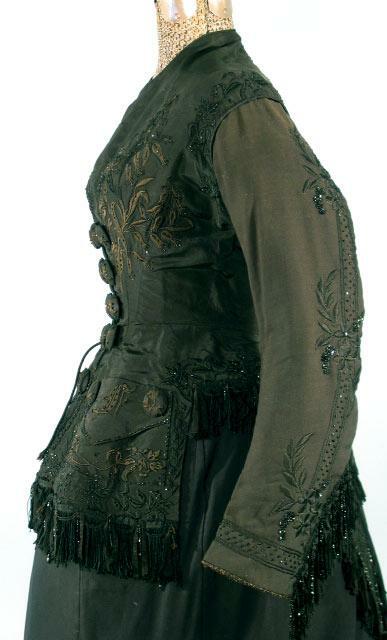 But I think I may also have totally forgotten that one of my favourite costumes from film has a very heavily pearled tablier! In fact this so closely matches my image in my head that perhaps I was thinking of it all along! 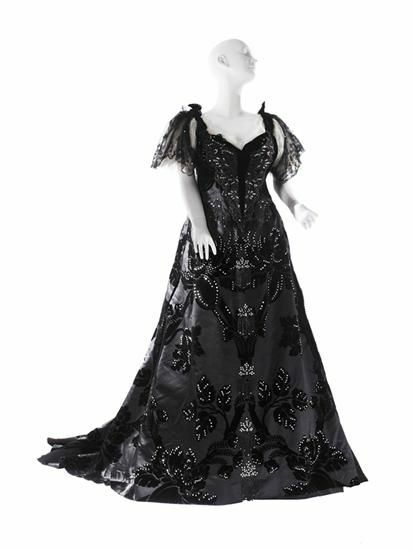 Though the company that created the gown is very well known for using historic sources so there may also be some influence of the same sources! Author m d bPosted on 2017-03-27 2017-04-16 Categories rock the frockLeave a comment on oh no! Sierra Boggess shared this image yesterday and can you see what has made me so excited? The fabric is thin. 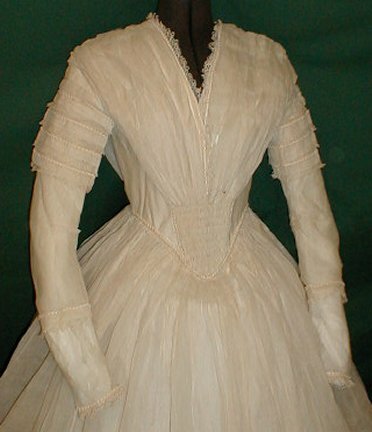 Well fairly thin- the flash and angle allows us to see her skin across the arm while the fabric looks more opaque closer to the armscye (where the fabric turns and follows the curve of her shoulder.) 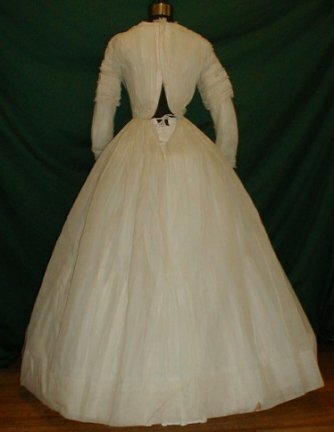 The sleeves are either unlined or lined with something very fine while the bodice is flat lined in a solid white. 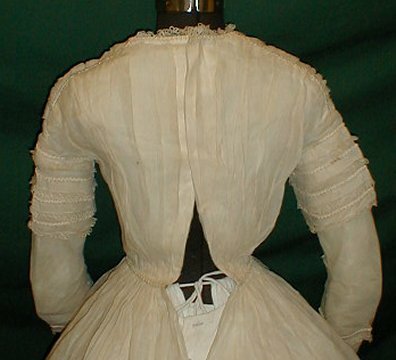 I tend to double line my bodices and either not line or line my sleeves in a very thin material too. 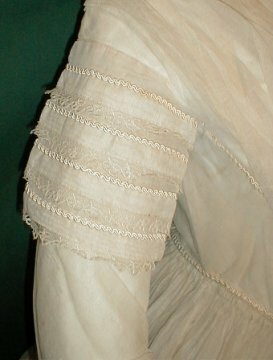 Also if you follow the lines of the fabric on her sleeve you can see how very shallow the sleeve head is. This is both era appropriate and theatre appropriate as it means you can get your arms over your head. Notice the small wrinkles between shoulder and armscye? Yep. 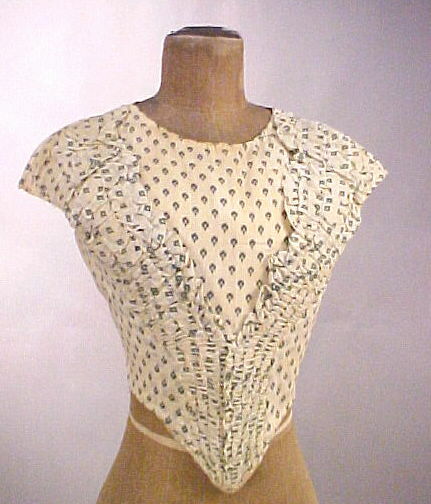 Modern patterns try to eliminate that by using a very tall sleeve head and that is what gives us limited arm range. 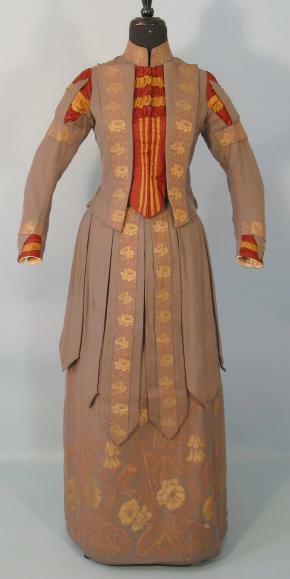 The effort to make a garment look good on the stand makes for a garment that is far less practical. Anyway, just my thought process when I look at new/different images of the same garment 🙂 It’s all about the fit. 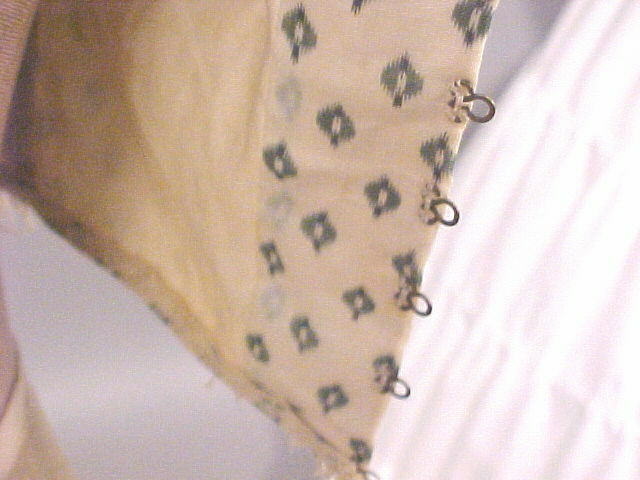 Oh and there is probably a bit of ease in the top of the sleeve head, I use three rows of stitches to do this rather than two as it does makes the fine gathers almost invisible. Happy birthday to @andrewlloydwebber!!!!! So grateful you are on this planet!!! 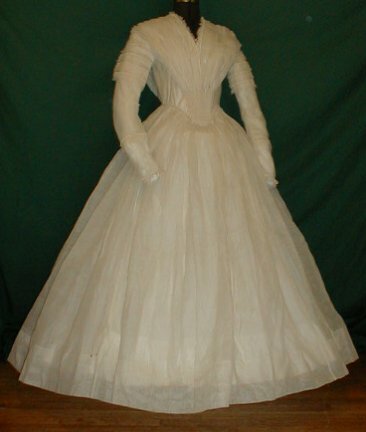 I am fabiliar with padding being used in some later gowns- mainly areound the front of the armscye to help reduce wrinkles, but this is quite different. Also effective! 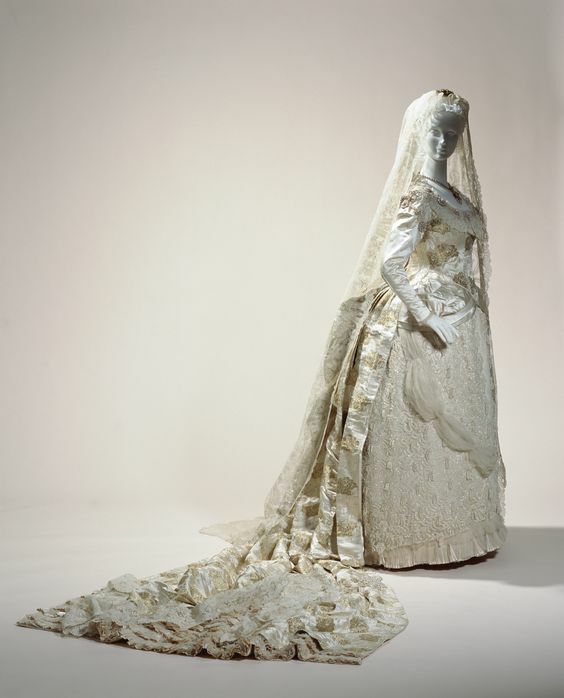 This era is post romantic stays with the long rigid busk that pushed the bust upwards, and the start of the opening busk and slightly lowered bust that came with it. 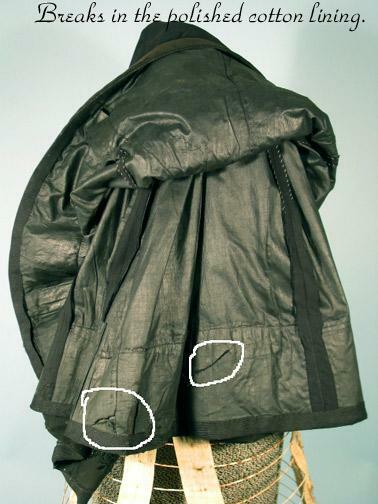 This padding helps maintain raised bust, or creates one. Other construction notes are to follow the pattern direction- the waist is on the grain, only diverting in the front point. this helps stabilise the waist. 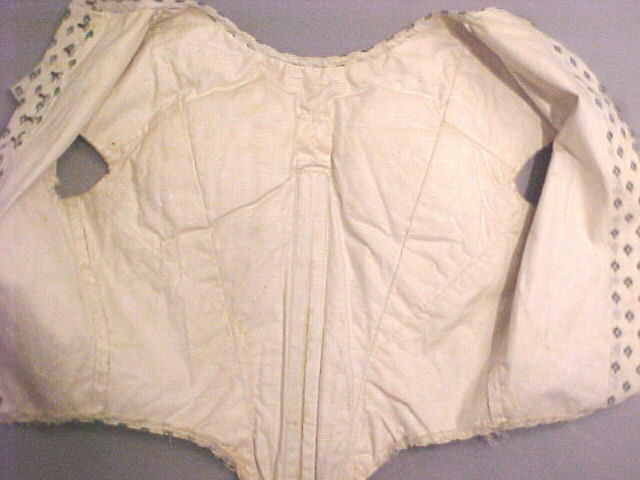 While this is a cotton bodice, the lightness of the construction can be seen across most garments from this era and beyond. 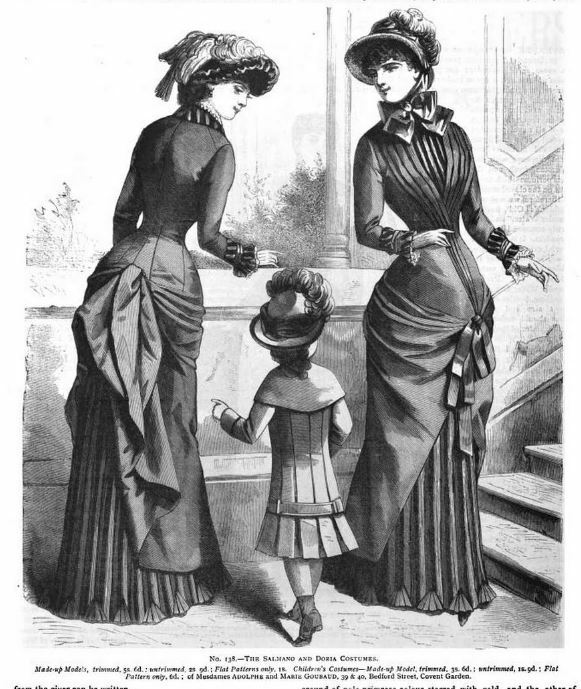 all the support of skirt shapes and body line is created in undergarments. 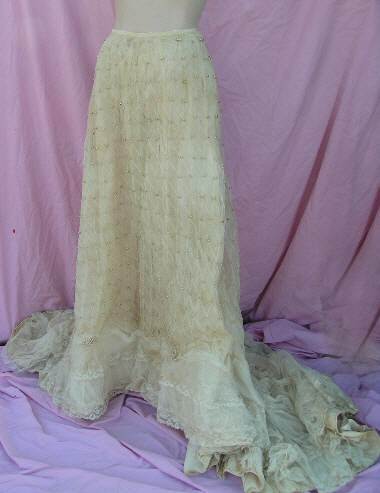 This kind of sheer dress is on my “most looked for” list when I hunt out, and this is just so perfect an example but with such clever sleeve details so as to make this one likely to be moved into the “must make” folder 🙂 I have a gown I could make over into this 🙂 time to get that dress back into my site pages too. Okay, this is just very cool and beautiful. 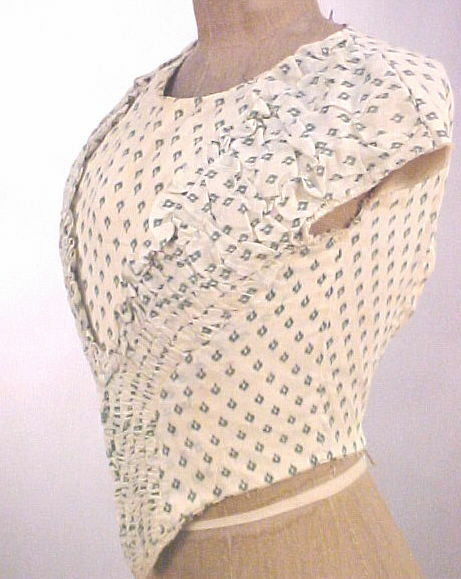 The skirt is lined in a matching glazed cotton and the back has a closing that will avoid any gaping appearing- possibly needed due to the very short center back peplum. 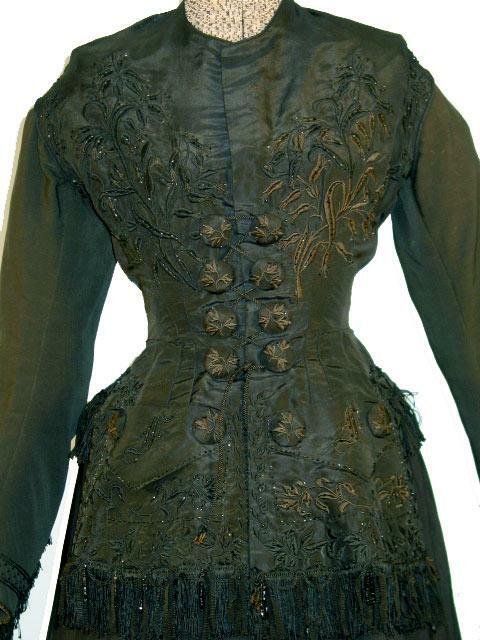 The sleeve shape is very full at the upper part which suggests this is possibly very late 1860s or very early 1870s. Oh my. 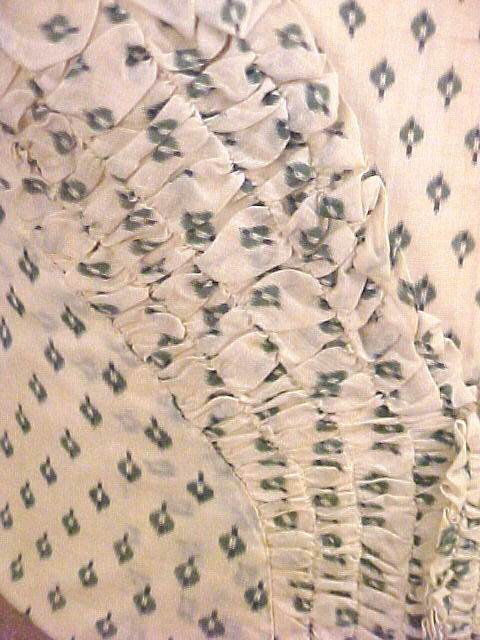 How beaituful The skirt has a plain front with very sharp pressed pleats in the back that each show off the woven design beautiful. 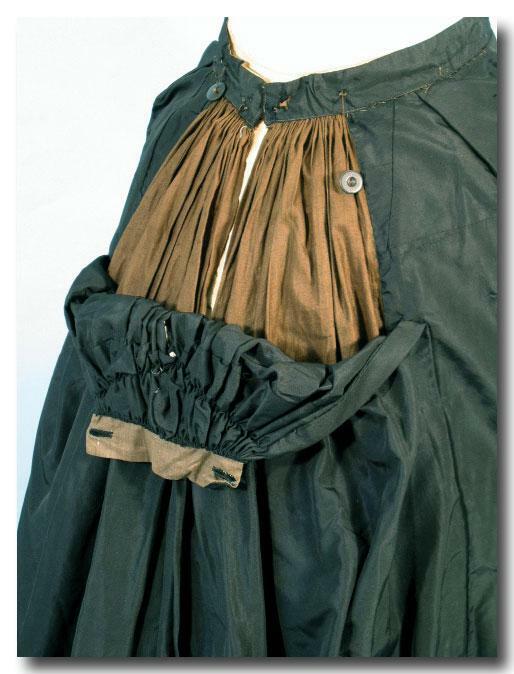 The hanging tabs can be seen in garments from at least the 1860s but this half skirt made from them replaces a traditional apron type of drapery.